The Nike No Show Socks are lightweight, low-cut and designed to be almost invisible under your running shoes or trainers. Arch support provides stability, and a reinforced heel and toe promise enhanced durability in high-wear areas. 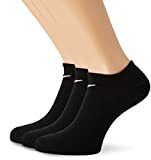 Non-cushioned for a lightweight feel without extra bulk, these men’s cotton and nylon socks have a touch of spandex in the fabric for a stretchy, snug fit.